We are so excited to announce that Guinot has added to their homecare eye range, Age Logic Eye Mask. After the launch of the Eye Logic Facial, which resulted in a dramatic improvement in three target areas: wrinkles, puffiness and dark circles, Guinot has made the Age Logic Eye Mask available to purchase for home use. This mask will help to encourage longer lasting results the Eye Logic Treatment. The eyes are the first area to show signs of ageing and fatigue. The skin around the eyes is thinner and more fragile than the skin on other parts of the face. With exposure to wind, cold and the Sun, early onset of wrinkles and lines can become more visible. Fluid buildup, fatigue poor circulation and inadequate care can accentuate any puffiness, as well as those unattractive dark circles around the eye. The mask is exclusively patented by Guinot and is made of microfiber, allowing hold more of the restorative serum concentrate. It’s shape and material perfectly fit the eye contour area. Each mask is individually sealed and comes in a set of four. Designed for someone on the go who want to extend the lasting results of the Eye Logic spa treatment and those who want instant visible results, with dark circles puffiness and wrinkles. The Age Logic Eye Mask is the exact same mask that is used in the spa’s Eye Logic Treatment and now it’s available for you to use at home. Each mask contains powerful active ingredients that deliver real results. ATP (Adenosine Triphosphate): Delivers and stores essential energy to the vital function of the cell, for younger looking skin. ACTINERGIE: Increases the oxygen consumption of the cell, boosting cellular metabolism. CELLULAR LIFE COMPLEX: Promotes cell growth renewal and longevity. DERMOCHLORELLA (Green Seaweed Extract): Boosts the micro circulation thus helping to drain the eye lids and under eye area. During our Open House in June, we launched a brand new series of treatment packages called Skincare Programs. There are six different programs, each one designed to provide specific results to a targeted audience. Each program consists of 4 treatments that are to be completed in a 6-week period. The reason we are calling these packages “Programs” is because that is exactly what they are! 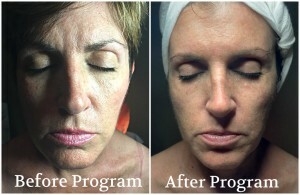 In a short time frame, the Program recipient will have a dramatic change in the look, texture, and health of their skin. These Skincare Programs are great for anyone who is looking to amp up their skin before a big event, such as a wedding or a reunion. Or simply someone who wants to have better-looking skin and wants to begin with a jumpstart, making maintaining healthy skin so much easier. We wanted to show our clients how completing a Skincare Program can make such a dramatic difference so we are going to follow along with one of our clients, Mary, as she starts and finishes her very own Skincare Program. Over the next few weeks, you’ll get to know her and learn about her skin concerns and goals, but most importantly, you’ll get to watch her skin improve throughout the Program, as well as see her final results! Mary has been coming to Fountains for the past 25 years, she is the mother of 3 children whose ages range from 18 to 23 years old. She is also the fur-mother of 4 dogs and 1 cat. Needless to say, she can be a pretty busy lady. Mary wanted to get a head start on boosting her skin’s overall appearance since her daughter will be getting married next year, and there will be many events she’ll be attending leading up to the wedding. 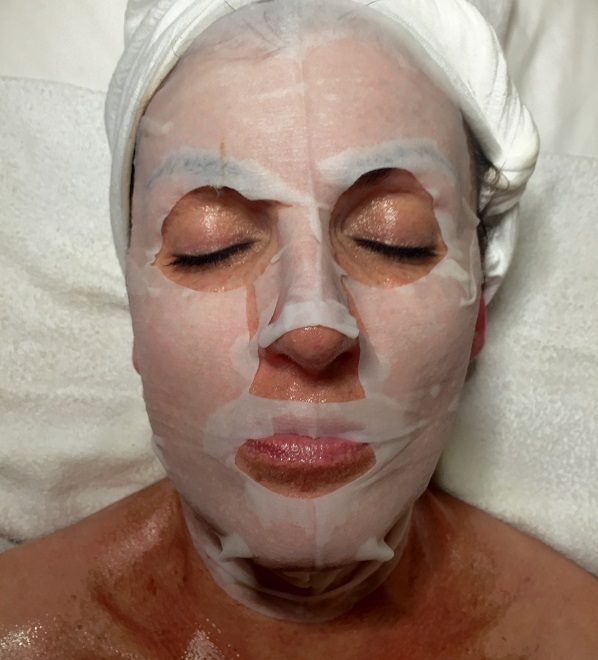 When Mary came in for her first facial of her Skincare Program, she mentioned, “I’m getting older and the lower (half) of my face is falling and sagging”. Based on this information, Suzanne, Mary’s Esthetician, and Mary both decided that she would be a perfect candidate for the Anti-Aging Program, which consists of 2 Age Summum Facials, and 2 Lift Facials. Suzanne has been working with Mary for many years now and knows her main concern is slowing down the aging process, minimizing the appearance of lines and wrinkles as well as preventing drooping around the eyes. The Anti-Aging Program consists of two very powerful and complementary facials for combating aging skin. 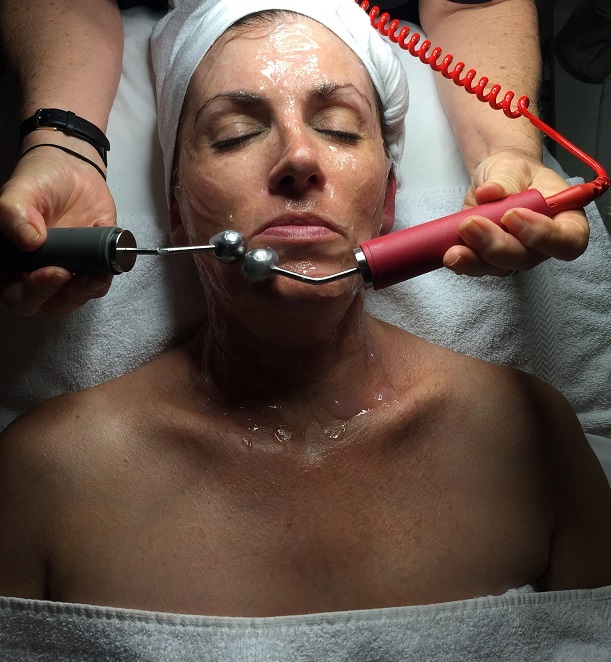 The Lift Facial addresses the signs of aging internally by toning and stimulating the facial muscles and skin through the use of micro-current. While the Age Summum Facial focuses on the face externally by exfoliating and plumping the skin, providing a more youthful appearance. Throughout the Anti-Aging Program, Suzanne expects that Mary will notice a gradual tightening and lifting of the skin, especially around the neck and eye area. After the Program is completed, Mary’s skin will feel plump and fuller and have an overall more youthful skin tone and appearance. 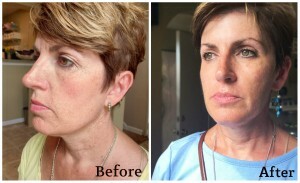 See Mary’s results after completing her first facial in the program.